Jurassic Park: The Game is an episodic, downloadable third-person adventure video game developed by Telltale Games that is based on the Jurassic Park franchise. The game, which is the latest of several Universal/Telltale deals, was originally announced in June 2010 before being revealed in the February issue of Game Informer. The first episode was expected for release in April 2011, but instead was pushed back to November 15 along with the original Console (PlayStation 3/Xbox 360) release, resulting in a multi-platform release with all 4 episodes at once. The game was originally announced on June 8, 2010 along with Back to the Future: The Game. However, Back to the Future was released first, on December 22, 2010. 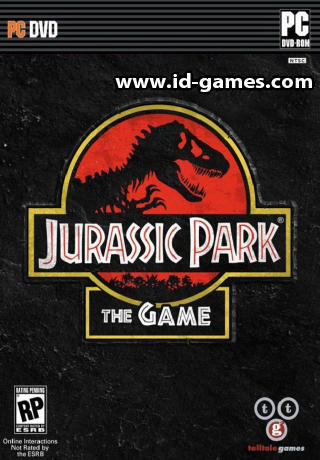 On January 14, 2011, in an exclusive article for Game Informer, Jurassic Park: The Game was officially unveiled. The game is set to have an original plot that takes place both concurrently and after the plot of the original Jurassic Park film and is set to resolve some loose ends of the film, such as the fate of Dennis Nedry's shaving-cream can and the embryos contained within. It was also announced that there will be new characters such as Dr. Gerry Harding - who appeared briefly in the movie - will make an appearance and that the characters from the original film will only be referenced. There are also returning dinosaurs, which are the Tyrannosaurus, Velociraptor, Dilophosaurus, Parasaurolophus, and Triceratops, as well as a new, nocturnal dinosaur with glowing eyes, which has been confirmed to be Troodon, and Tylosaurus that will be seen in Jurassic Park's marine facility. The game will also include dinosaurs, such as Herrerasaurus and Compsognathus, and also Pteranodon that were known or speculated to have been in the park but were never shown. It has been stated that the game will not be a shooter and instead focus more on its characters. The developers have described it as being similar to Heavy Rain. It will also have decision-based objectives as well as quick-time events that affect gameplay as well as how the game's events play out, making it the first game by Telltale in which the player can be killed.